Inspire acres of imaginative play with this fun, foldable play set by designer dad Luis Albarrán. Cardboard Acres was the friendliest farm in the county, where kids grew their imaginations and playful animals frolicked in the fields. Dad and designer Luis Albarrán noticed something universal about children: They love to play with boxes big enough to become a barnyard. So he created this play set to take little farmers' imaginations to the next level. Unfold and assemble the barn (complete with turning windmill) in minutes without any special tools or extra farmhands. Kids can feed their new animals (which only eat paper hay) and cultivate magical crops wearing the included overalls. And the best news of all: Everything is made from 80% recycled (and 100% recyclable) materials for a back-to-the-land side to this story. The playhouse and accessories are water resistant and can be customized with washable markers, but shouldn't be left outdoors in rainy pastures. When the chores are done, the foldable design breaks down in seconds to store in the shed next to the tractor. Made in Mexico. Luis Albarrán leads a group of parents and dreamers who also happen to be multidisciplinary designers and engineers. 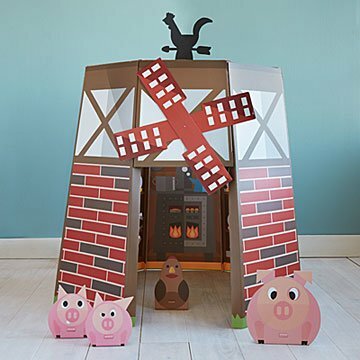 Together, they created a collection of cardboard playhouse themes, characters, and accessories aimed at unleashing the creative potential within every child. Luis' Mexico City-based team follows an environmentally friendly philosophy as they develop sustainable cardboard products for the world to enjoy. They seek ongoing innovation within the structural challenges of cardboard, while positively influencing the way children play, imagine, and learn.